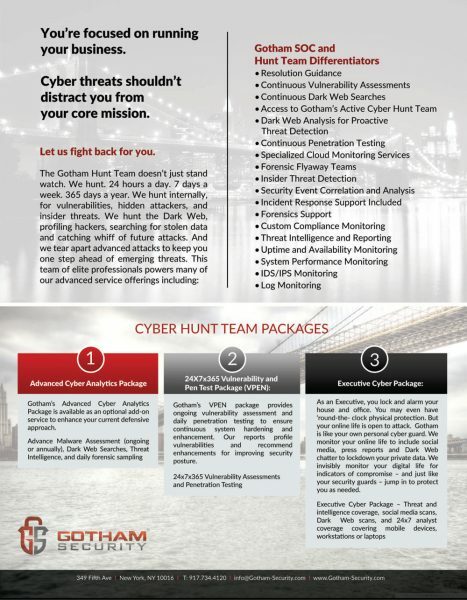 Take action with your cyber security and quickly remediate threats with Gotham Security’s managed security services. Our refined approach to cybersecurity combines technology, expertise and intelligence to enhance your organization’s ability to detect, identify, respond to and recover from cyber security threats. We protect our clients – Fortune 500 companies, small and mid-size businesses, and government agencies – utilizing two state-of-the-art 24-hour Security Operation Centers (SOCs) located on the East Coast and in the Midwest. All of our managed security services are customized specifically for each organization’s needs with options that extend far beyond the industry norm. Comprehensive monitoring, alerting and remediation services, as well as complete management of your security program, including continuous monitoring, penetration testing, vulnerability assessments, code review, proactive deep and dark web searches and forensics. 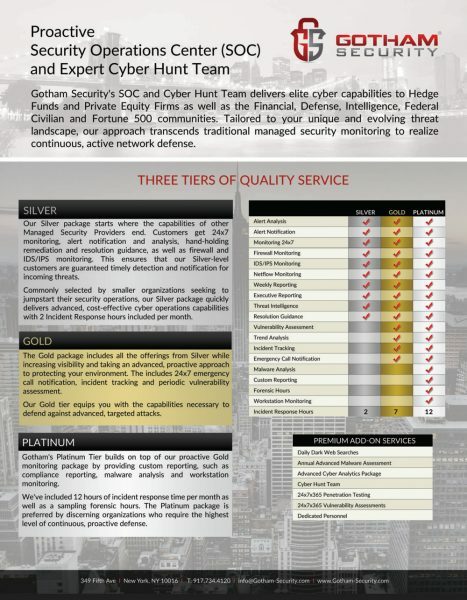 To learn more about our Managed Security Services, contact us at info@gotham-security.com or 917.734.4120.